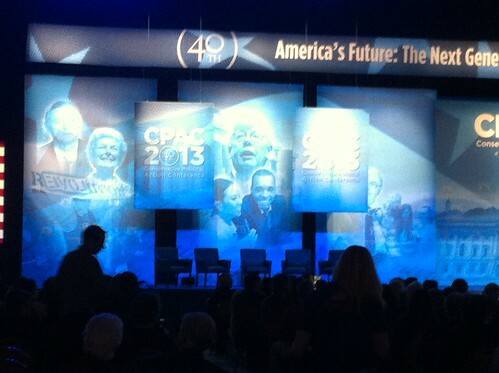 CPAC 2013: Allen West speaks in front of clip-art minorities. Rep. Allen West (R-FL) speaks during a news conference at the U.S. Capitol December 19, 2011 in Washington, DC. One of the first speeches at CPAC came from former Rep. Allen West, a black conservative who delighted—and delights—in telling liberals they patronize and misunderstand blacks. “I know from personal experience,” he said, that nothing on earth scares the left like a black American who can “think independently.” Behind West: A seven-panel display, paying tribute to decades of conservatism and conservative heroes. Strangely missing from the display: Any black conservatives. From the left, in my pic below, you can see (first panel) William F. Buckley, Phyllis Schlafly, and Ron Paul supporter; and (second panel) former American Conservative Union President David Keene, above… clip art. That’s clip art of a smiling black guy talking to an Asian woman. As one’s eyes travel across the display, they can see Jesse Helms, Barry Goldwater, and Ronald Reagan. The conservative who pointed this out to me wondered why CPAC didn’t just grab a pic of Herman Cain or Mia Love or—hey, Allen West!